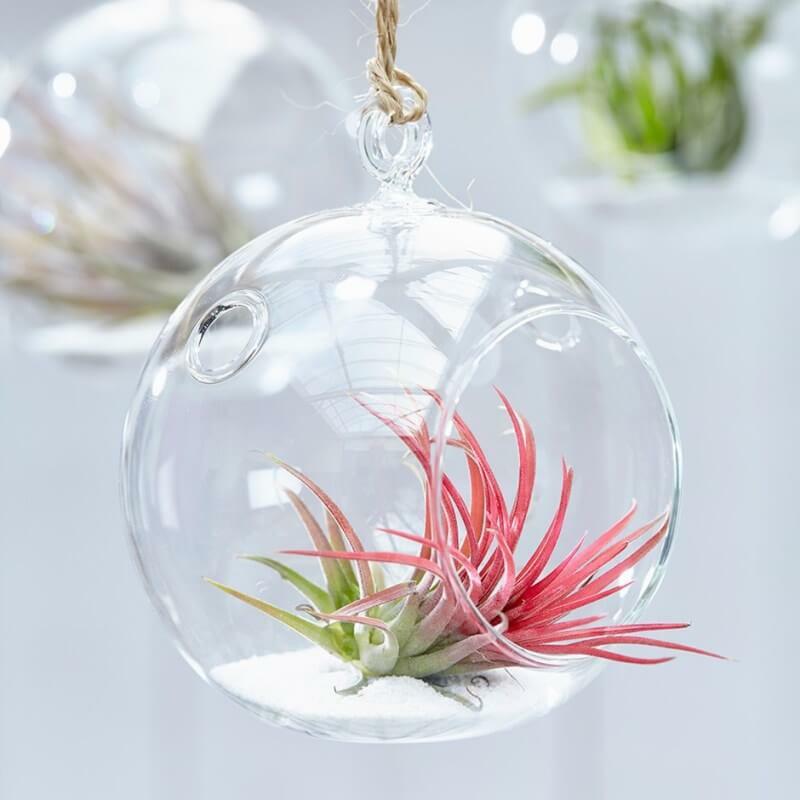 Air Plant (Tillandsia ionantha) is a small air plant with stemless rosettes to 12cm in height, forming dense clumps. The leaves are thick, narrowly triangular to 6cm in length, with silvery gray-white trichomes on the surface. Innermost leaves turning bright red when plants begin to flower. The flowers are long-tubular, purple-violet. The fruit is a subcylindric, acute, septicidal capsule about 3 cm in length containing the seeds, each having a feathered tuft of hairs. It thrives well in bright light, but not direct sunlight. South, east or west window is perfect. They can also be grown under fluorescent tubes. 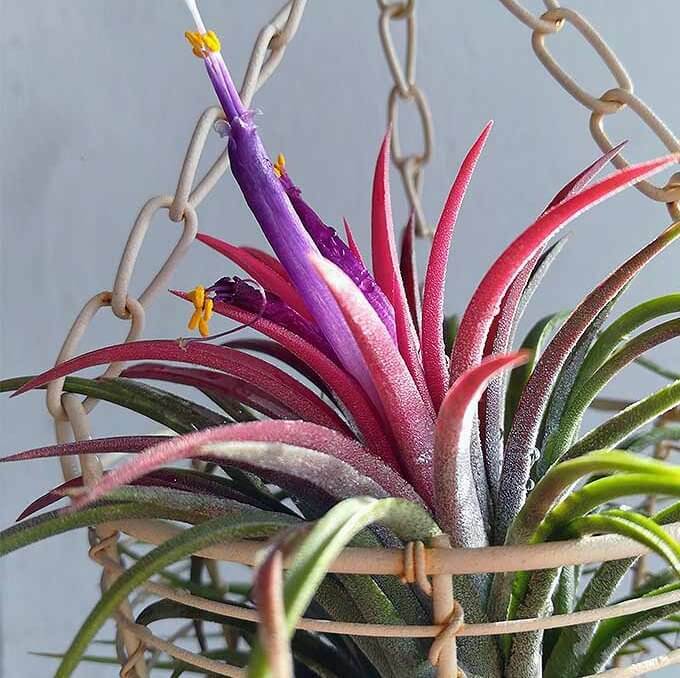 Tillandsia refers to be mounted on a solid substrate that does not retain water. You can glue the plant directly to the surface with a strong adhesive or you can wire the plant to the base. Don’t cover the base of the plant with moss or it may rot. It can be grown on almost any imaginable decorative mount, including shells, rocks, slate, driftwood, etc. Water two to four times a week with a mister. If your environment is dry, mist daily. Water until leaves is thoroughly wet. The water that runs off should be enough to wet the roots. Do not soak base of a plant. Use rainwater or filtered tap water for misting your plant. Soft water contains too much salt and some tap water contains chlorine and fluoride that can leave water spots on foliage. It thrives well in average room temperatures 60 degrees Fahrenheit – 75 degrees Fahrenheit / 16 degrees Celsius – 24 degrees Celsius. Fertilize once every month with a low-copper liquid fertilizer, diluted to 1/4 strength. It can be easily propagated by detaching offsets, or pups, from the base of the mother plant. When the pups are half the size of the mother, they can be divided and mounted on their own. Tillandsias can also be grown from seed, but this is a slow process that might take years.